Cybercrime, one of the world’s biggest crimes, goes nearly unnoticed. The Internet of Things makes mobility, businesses and industries more connected, but it also leaves them more vulnerable to cybercrime. Online hacking has become so widespread that, by 2021, it is estimated that the cost of cybercrime damages will be $6 trillion annually. All it takes for a hacker is finding a single weak link, from the outside or more commonly inside, in a surveillance network to gain access to, and jeopardise an entire data system. To cancel out this risk, employ a data security system that’s been configured by experts with vast cybersecurity knowledge to make it completely effective from end-to-end. The reputation of Genetec and Bosch in the field of mission-critical video security projects is constantly growing. Having access to the video management system (VMS) expertise of Genetec and Bosch’s innovative surveillance cameras gives customers the upper hand over the hackers, because Bosch cameras are fully integrated with Genetec systems, resulting in an end-to-end data security solution incorporating all Bosch network video surveillance cameras, plus Genetec Archiver and Security Center. All network-wide communications between Bosch cameras and Genetec Archiver and Security Center are assigned an authentication key. This electronic signature enables the system to verify the legitimacy of network components like cameras or storage units, and viewing clients, ensuring that an infrastructure of trust is built before network-wide communications start. Cybercrime is one of the greatest threats to every company in the world, so an effective and reliable method of safeguarding the video security infrastructure is needed. This is why encryption of data streams and stored data is vital. All Bosch IP-cameras have a built-in Trusted Platform Module (TPM) to safely store cryptographic keys used for authentication ensuring trustworthy communications between all network components and encryption of all video data. All cryptographic operations, for authentication and encryption, are only executed inside the unique built-in Trusted Platform Module (TPM). Encrypted video data is then sent from the camera to the Genetec Archiver using SRTP (Secure Real-Time Transport Protocol). Additional security is established via a ‘permissioning’ scheme based on privileges accumulated by specific users. Because Genetec Security Center integrates with Active Directory, user management can be monitored and centralised at Windows level. As well as individual users, user groups from Active Directory can be synchronised with Security Center, whilst new users will automatically inherit existing Security Center privileges defined for that group. Passwords are still an essential layer of security, but the Genetec Archiver also uses a client certificate (which can be signed by a trusted third party and is factory-installed) to authenticate themselves to the Bosch IP camera. In addition, only Bosch-approved firmware updates will be accepted, and any cryptographic operations are only executed inside the unique built-in Trusted Platform Module (TPM). 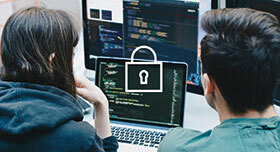 Certificates are less at risk from hacking, which is why Genetec uses certificate authentication for its Security Center management software and clients. The video management systems interact directly with the Bosch cameras using certificates for authentication, and because stored data stays encrypted and data is transmitted via SRTP (Secure Real-time Transport Protocol) confidentiality and data protection are guaranteed. Using SRTP throughout the whole video security infrastructure enables customers to set up a secured multi-cast network, and get security and good network scalability at the same time. For more information contact Bosch Security and Safety Systems, +27 (0)11 651 9600, security.systems@za.bosch.com, http://africa.boschsecurity.com.